Swifts, orchids, a soldier sparrow and meadows are amongst this week’s highlights in Unforgettabubble. Here is the week 18th – 24th June 2017, in pictures. a Woodpigeon is too heavy for a tree and it starts to bend…. …and a Treecreeper is almost squinting in the exceedingly bright sun. Up on the slopes above Bubble HQ, the Foxgloves just keep on coming and look glorious on a very bright day. Up above them, a Tree Pipit get vocal. As the week begins to cool, Seivedale Fen in Dalby Forest really gets going with a fine array of wildflowers such as Betony, Harebell, Common Spotted Orchid and a variety of vetch just coming into flower. …and, always making me smile, the Marsh Helleborines are just starting to bloom. …whilst others, like this Meadow Brown, are busy, flitting amongst the flowers. Whilst searching for micro moths in the grasses, a much bigger moth is spotted. Unable to identify it in the undergrowth, I pot it and see that it is Large Yellow Underwing, releasing it back to the undergrowth, unharmed. Usually seen at night, it’s nice to see this one in daylight. In contrast, this Silver Ground Carpet doesn’t try to hide and sticks out like a sore thumb. 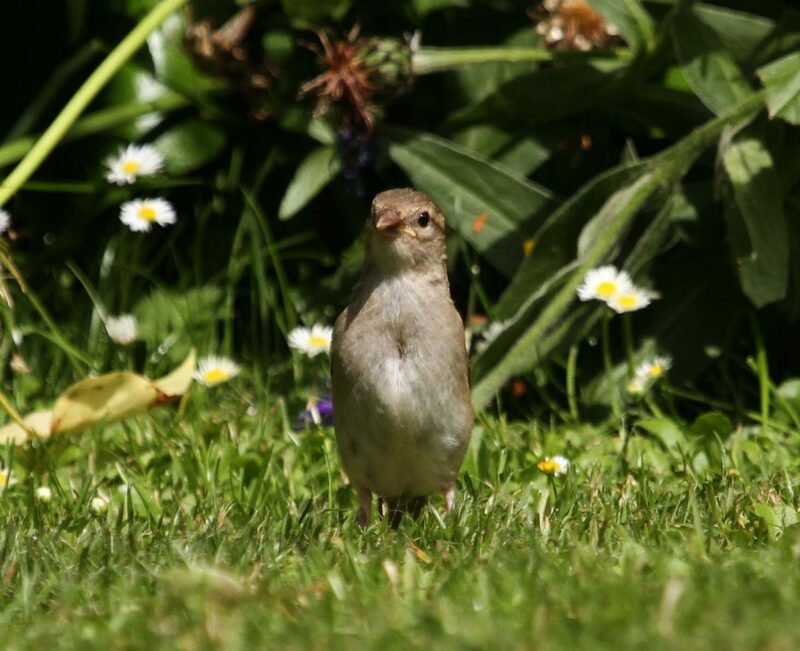 And, finally, back at Bubble HQ, a baby House Sparrow stands on parade. I half expect him to salute!